Posted on October 14, 2018 by Mike Sonnenberg Posted in Ghost towns, Houses	. 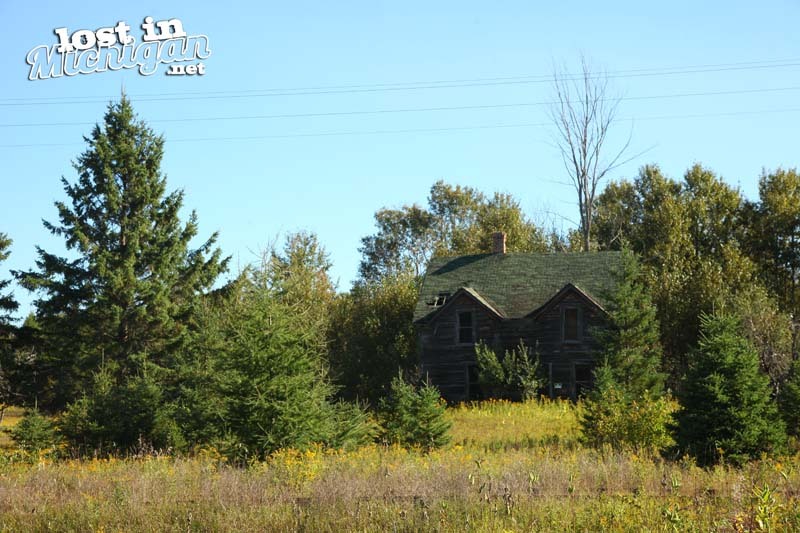 I was headed down county road 426 in the Upper Peninsula to the ghost town of Watson, you can read about it HERE. The road runs along the Escanaba & Lake Superior Railroad tracks. Weeds and small trees are growing up between the rusty rails, so I assume they have not been used in years. Somewhere between Cornell and Watson, I saw an old house in the woods on the other side of the tracks. 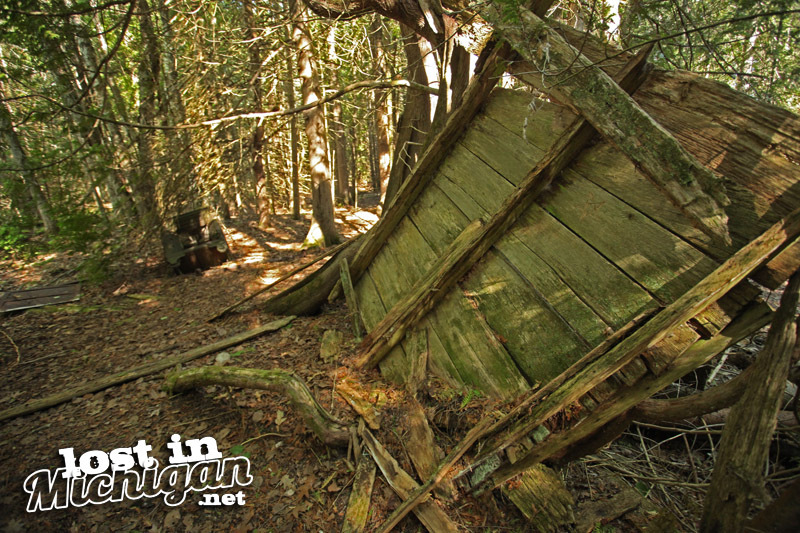 Most of the old abandoned houses I see in the Upper Peninsula are smaller shacks and cabins. I couldn’t help but wonder what the story was with this old building. I found on an old county map and it shows the name of the town of Woodlawn. A reference stated that the town was originally called White, but the name was changed to Woodlawn when it got a post office in 1905. I am wondering if this is the remains of the old town, and maybe it was a boarding house or something. I took a pic from the road and you can see the old railroad tracks at the bottom of the photo. I often wonder about these old places, and I also wonder if I am the only person who drives past them and is curious about their history. Posted on October 11, 2018 by Mike Sonnenberg Posted in Cemetery, Forgotten Places, Ghost towns	. Northeast of Bayport at the end of Sand Road is the Old Bayport Cemetery, It sits on a hill with large trees standing between the tombstones and monuments. I imagine when the cemetery was created over 150 years ago the trees were just little saplings. 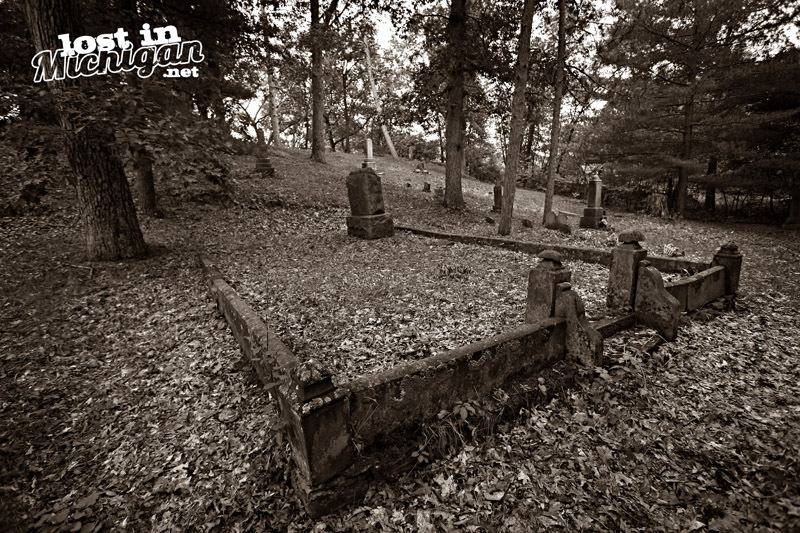 The old cemetery is the final resting place for some of the people of the Ora Labora colony. The colony was formed in 1862 when Rev, Emil Baur purchased 740 acres on Wild Fowl Bay. For $25 members could join the colony named Ora Labora after the Latin phrase “ora et labora” which means pray and work. The colony started out with about 140 members and grew to about 280. Although the members were honest hard working people most were unskilled at farming, lumbering and construction. For instance, after purchasing cows and cattle they roamed away since they did not know they needed fences. After building a 300-foot long dock into Saginaw Bay one summer the ice in the winter destroyed the dock. Some of the members became ill and a little girl was the first one to die in 1862 which incidentally was when the cemetery was established. 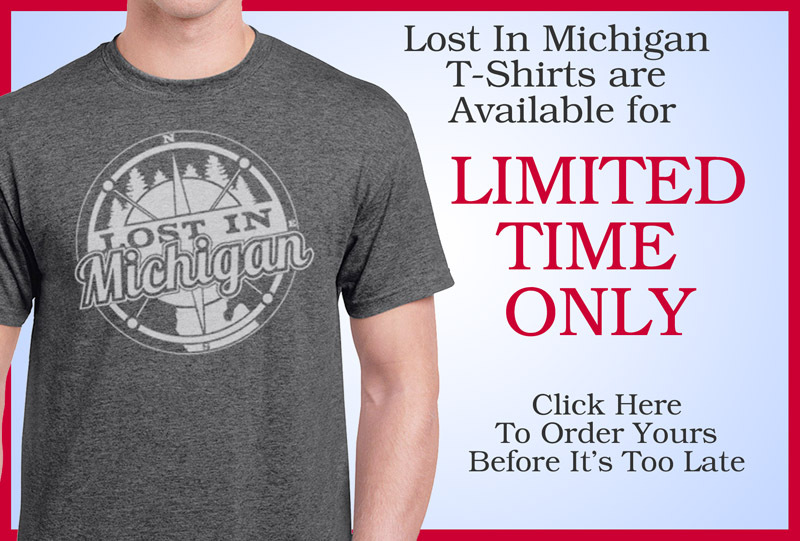 During the Civil War, many of the male members joined the Michigan Militia to fight in the war. After the war, most of them did not return to the colony. After incurring massive debt for supplies they purchased and they were down to about 12 members left the colony disbanded in 1867 and the remaining property was divided up amongst remaining people. The great fire of 1871 obliterated what was left of the colony and all the remains are the stone markers on the hill and the end of Sand Road. Posted on September 29, 2018 by Mike Sonnenberg Posted in Forgotten Places, Ghost towns	. 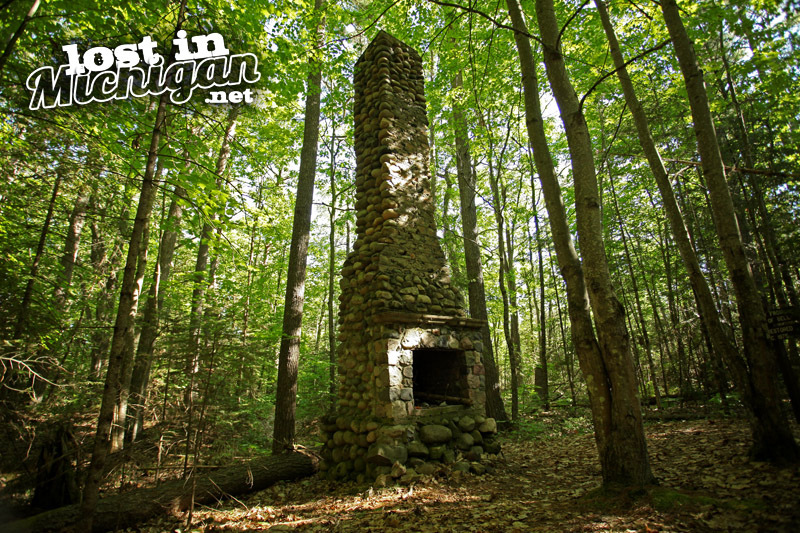 A large stone chimney stands tall marking the spot where the little logging town of Bell once stood. The remains of the town can be found in the Besser Natural Area north of Alpena near Presque Isle. A mile-long hiking trail loops through the area. You can see the remnants of the town along the trail. Besides the chimney, there are a few walls of an old general store and a broken safe lying nearby. 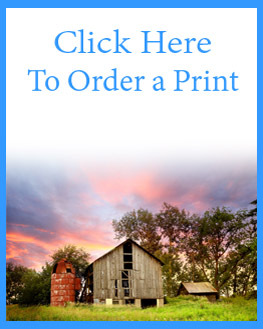 The village grew around the Presque Isle Brick and Lumber Company. The post office opened in 1884 in what I assume was the general store that you find in pieces today. The post office closed in 1911. Eventually, the townspeople moved away and local concrete magnate Jesse Besser purchased the land. He donated it to the state, and it is now the Besser Natural Area open to the public. If you visit be sure to take some bug spray. when I hiked the trail in the spring the mosquitoes were so thick they could have carried me away. P.S A cemetery for the former village is nearby but I could not find it. if you know where it is please post in the comments, I would greatly appreciate it so I can find it on my next visit.